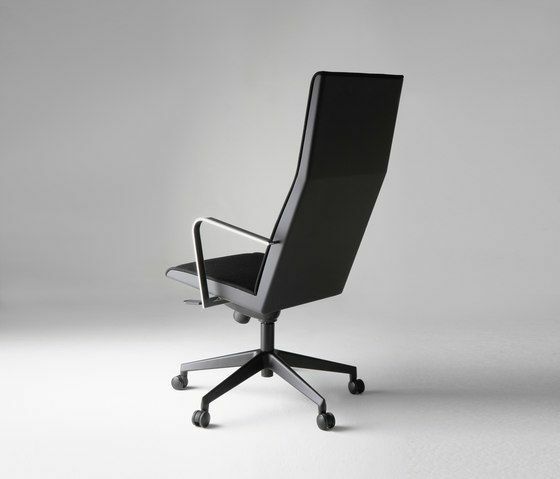 Pomo – a Finnish word for boss – is a group of chairs and tables for the high-end conference rooms. An aluminium seat with well proportioned dimensions and meticulous attention to detail make an elegant statement for a wooden chair. The Pomo X chair is available with a swivelling base, and with or without armrests. The Pomo X and A chairs make an outstanding combination with the Pomo conference table. Collection: Pomo X B3 executive chair – upholstered seat and back (inner or also outer side), armrests, castors Materials: Seat aluminium, leg and pole steel powder coated in RAL 9005 black, upholstered seat and back (inner side or fully upholstered), castors, height adjustment, swivel and rotation mechanism, armrests steel chromed with a plywood list. Metal finish options: The standard finish options are bright chrome, RAL 9005 black epoxy, RAL 9006 white aluminium epoxy, RAL 9007 grey aluminium epoxy and RAL 9010 white. Upholstery: Upholstered with fabric, leather or C.O.M. Other materials and finishes are available on request.